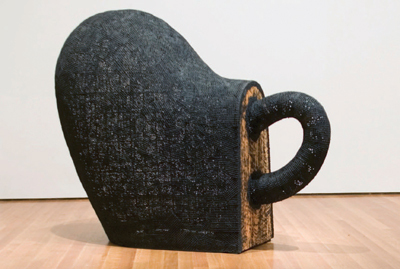 Martin Puryear, Dumb Luck, 1990, wire mesh, tar, and wood, 64 x 94 x 36". SCULPTURE HAS LONG PLAYED second fiddle to painting at MoMA (case in point: the Department of Painting and Sculpture), perhaps a consequence of the same giddy moment that gave us high modernism and the urban temple built to exhibit its wall-bound artifacts. This is surely changing, with MoMA’s institutional priorities effecting architectural exigencies: After the museum’s recent renovation, bigger rooms engineered expressly (or at least firstly) for Richard Serra mean bigger rooms left behind for other sculptors. Yet these subsequent installationsin which Martin Puryear’s retrospective, organized by John Elderfield, is sadly includednow suffer the unseemly fate of comparison to the “man of steel,” with the vast new galleries often overwhelming and estranging their objects.